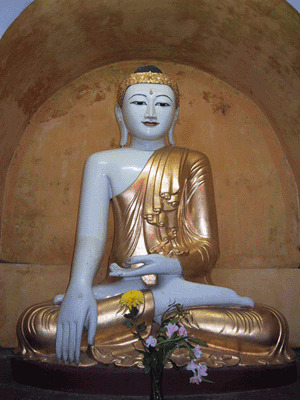 Buddhism is based on the teachings and life of Gautama Buddha. Buddha was born as a priviged Indian Prince as a child and young man he was shielded from the suffering and mortality of human life. However as a young man he one day ventured into the town and for the first time came across death, illness and suffering. This led the Buddha to question his wordly life. Although he had all of life’s material comforts this could no longer satisfy him. Therefore Siddhartha Gautama (family name of the Buddha) renounced the world and went in search of truth. For many years Siddhartha practised severe austereties bringing his body close to collapse, through constant fasting. However this did not bring him enlightenment. At one timea passing woman brought The Buddha some food and the Buddha decided to practise “The Middle Path” shunning both extremes of severe austereties and indulgence of desires. Finally the Buddha achieved enlightenment under the Bodhi tree. For the remaining years of his life the Buddha travelled all over India spreading his message of the path to Enlightenment amd Nirvana. His teachings attracted many followers and after his passing his teachings started to be written down, these formed the basis of Buddhism.